Today in Christian churches around the world hosannas will be said, sung, and shouted as Christians celebrate Palm Sunday, the start of Holy Week. Palm Sunday marks the day when Jesus entered Jerusalem after a time away. He rode on a donkey -- a mark of humility -- but was greeted like a king with crowds in the streets shouting “Hosanna!” and lining the streets with their coats. The events of the day fulfilled a long-held prophecy heralding the coming of the Messiah according to Christian theology. 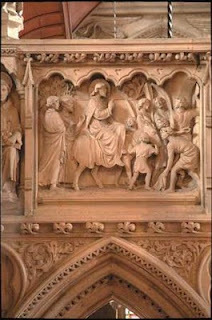 In Christian art, depictions of the events of Palm Sunday are often called “Christ’s Entry into Jerusalem” or some variation thereof. Key elements include Jesus (often with a halo around his head) riding a donkey and palm branches. However, many Northern European artists did not actually know what a palm branch looked like, especially in the Middle Ages, so the foliage may vary. 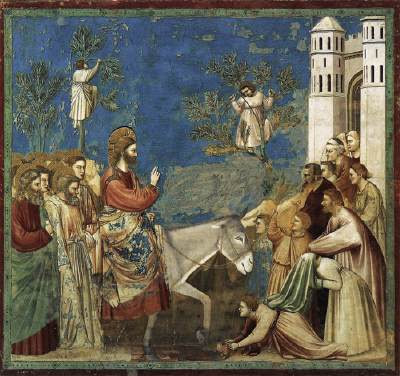 In many depictions of Palm Sunday have a sad, hollow feeling to them, too. While Palm Sunday often feels like a celebration, it is a hollow celebration because Jesus was executed just a few days later. 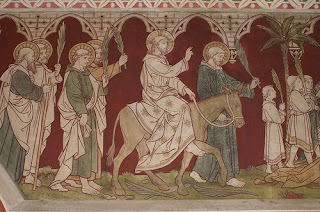 Palm Sunday begins what is referred to as Holy Week -- a week of events and remembrances of the final days in Jesus’ life. I’ll be blogging all week about Holy Week in Art. Stay tuned! Looking forward to your posts this week. Just wanted to say that I love Giotto...early Italian Renaissance is my favorite style! I recently found your blog on TBEX and I thought you might be interested in UpTake's new program called “Travel Gems” that features blog content from across the web on our site. It brings great blog content to a wider audience and helps bloggers like yourself increase traffic to their own blogs. I’d love to speak to you more about how this program works and see if you are interested in participating.